This paper presents STRIDE: a Secure framework for modeling Trust-pRIvacy tradDEoffs in distributed computing environments. STRIDE aims at achieving the right privacy-trust tradeoff among distributed systems entities. This is done by establishing a set of secure mechanisms for quantifying the privacy loss and the corresponding trust gain required by a given network transaction. The privacy-trust quantification process allows the service requestor and provider to create the required trust levels necessary for executing the transaction while minimizing the privacy loss incurred. Moreover, STRIDE supports communication anonymity by associating each communicating entity with an administrative group. In this way, the identification information of the communicating entities is anonymously masked by the identification of their respective groups. The confidentiality, authenticity and integrity of data communication are ensured using appropriate cryptographic mechanisms. Moreover, data sent between groups is saved from dissemination by a self-destruction process. STRIDE provides a context-aware model supporting agents with various privacy-trust characteristics and behaviors. The system is implemented on the Java-based Aglets platform. 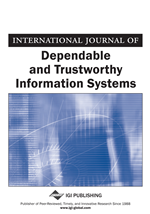 The work in (Abdul-Rahman & Hailes, 1998) presents a decentralized approach to trust management by defining a recommendation protocol to exchange trust-related information. It aims at reducing ambiguity via the exchange of explicit trust statements where entities ask trusted sources for information about unknown entities before deciding to trust them or not. This model is suited for the establishment of temporary trust relationships (as in the case of ad hoc networks). In Abdul-Rahman and Hailes (2000), and Mui, Mohtashemi, and Halberstadt (2002) the authors present reputation-based trust models. The main idea here is to give interacting agents the ability to establish trust relationships and to take decisions based on other agents’ recommendations as well as on previous experiences.